Bearings are one of the most important and yet ignored components of any skate. Proper bearing rating, installation and maintenance are keys to getting maximum advantage out of your wheels. 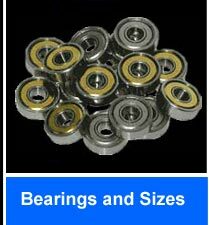 We sell the best bearings available anywhere. Our precision bearings are rated by the Annular Bearing Engineers Committee (ABEC), which has established a rating system to evaluate bearings. The higher the ABEC number the better the bearing. Most lower cost imported skates use bearings that are not even rated. Better skates use ABEC-3. The best that we have seen is ABEC-9. Very few manufacturers produce ABEC-7 or 9. Some companies that cannot manufacture the higher rated bearings because of the required strict tolerances, may claim that there are no significant differences between ratings. We disagree. Use our ABEC-7 bearings and feel the difference. If you are not happy, return them. For the price we charge, and the performance you receive from these bearings, you won't want anything else. (Note: Every bearing we sell is embossed with its ABEC rating).